The publication of Blaggard Castle - a 1932 comic book featuring Mickey Mouse and sidekick Horace Horsecollar, in which three mad scientists (Professors Ecks, Doublex and Triplex) claimed that X-rays, if fired at someone, would burn their brains - caused so much unease amongst young patients in Pennsylvania that a Dr. Reuben G. Alley was forced to complain to Disney Studios. 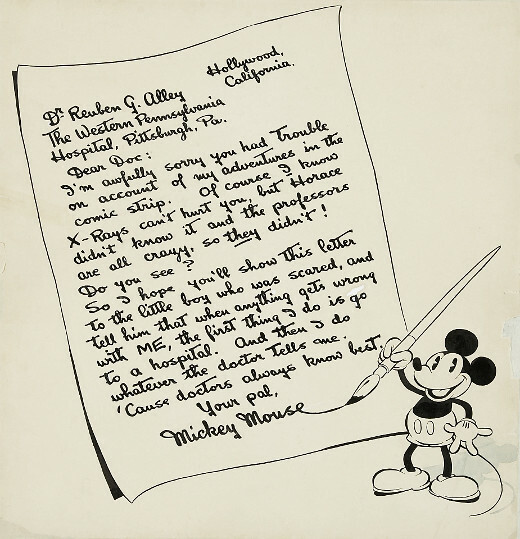 A response came in the form of the following letter, written by Mickey Mouse himself in an effort to quieten the wards of Western Pennsylvania Hospital. I'm awfully sorry you had trouble on account of my adventures in the comic strip. Of course I know X-Rays can't hurt you, but Horace didn't know it and the professors are all crazy, so they didn't! So I hope you'll show this letter to the little boy who was scared, and tell him that when anything gets wrong with ME, the first thing I do is go to a hospital. And then I do whatever the doctor tells me. 'Cause doctors always know best.